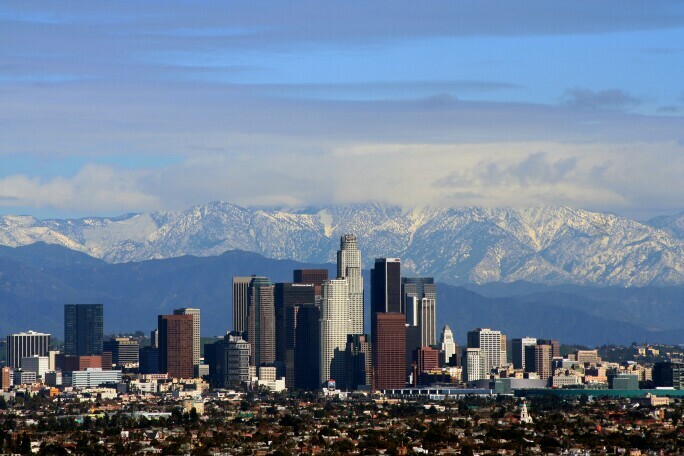 Despite its size and global status, Los Angeles is a permanent work-in-progress. It is both a city of the future and a city in its infancy. T he instability of its relatively new art institutions means that they are constantly in a state of negotiation; museums, non-profit spaces and commercial galleries alike are expanding, switching direction, rebranding themselves and – sadly – also closing. Los Angeles. Photo: Todd Jones. Nevertheless, it is undeniable that the city’s art world is currently at the apex of a roughly decade-long boom, a position that is affirmed this February by the inauguration of the long-rumoured and much-anticipated Frieze LA art fair. There has never been a better time for art lovers to visit. 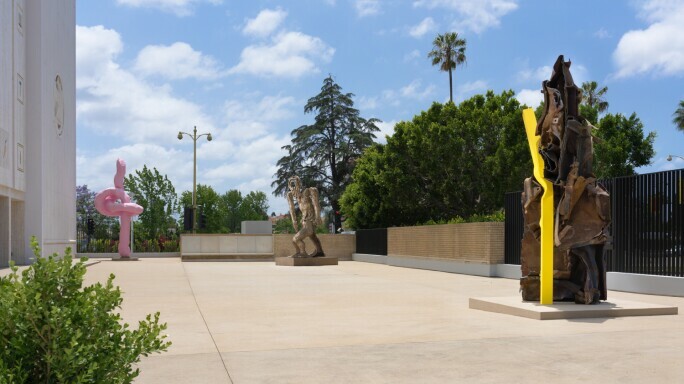 Under the leadership of Michael Govan, the Los Angeles County Museum of Art has become a thriving cultural powerhouse and a major tourist draw. 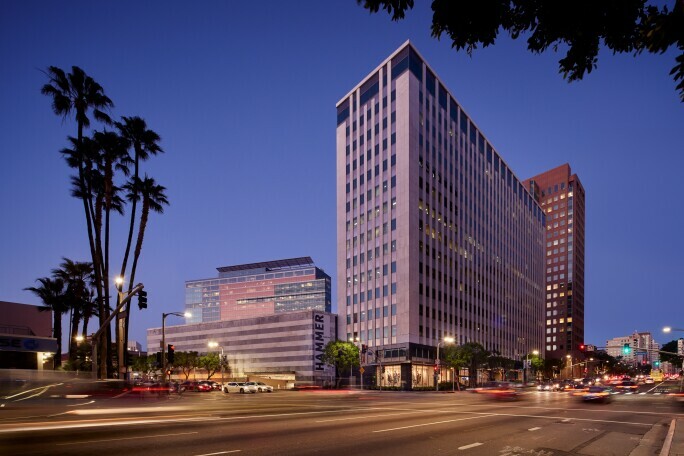 Situated in what passes for the centre of the city, on Wilshire Boulevard’s “Miracle Mile”, the museum campus sprawls across a park containing numerous ancient tar pits that are still bubbling. Don’t miss: Chris Burden’s Metropolis II, 2011, a kinetic portrait of a modern city, in which over a thousand toy cars, plus model trams and trains, whizz around on a tangle of tracks. 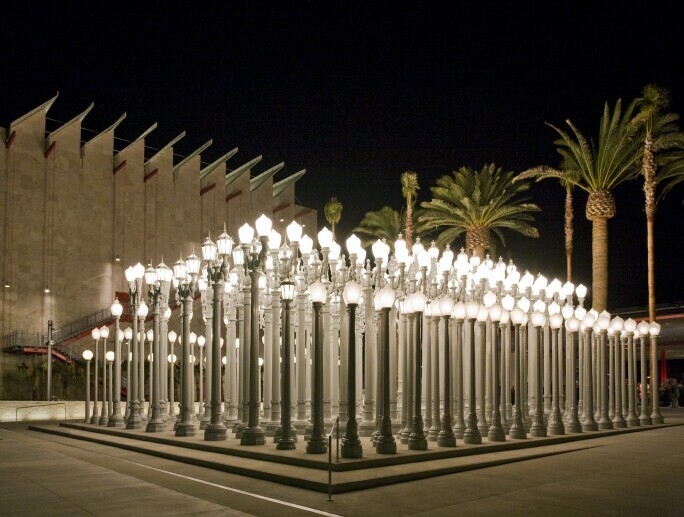 Insider’s tip: If you are visiting with children, enrol them in LACMA’s free ‘NexGen’ programme to get free entry for each accompanying adult. While the Museum of Contemporary Art has had its ups and downs in recent years, its Modern and contemporary collection remains unequalled in Los Angeles, and it maintains an unpredictable and challenging exhibition programme. One ticket gives you access to both the Grand Avenue building (opposite The Broad) and the vast Geffen Contemporary annexe in Little Tokyo. Don’t miss: The uncharacteristically jolly Rothkos, and the excellent bookshop. Insider tip: Park at The Broad, or take an Uber. 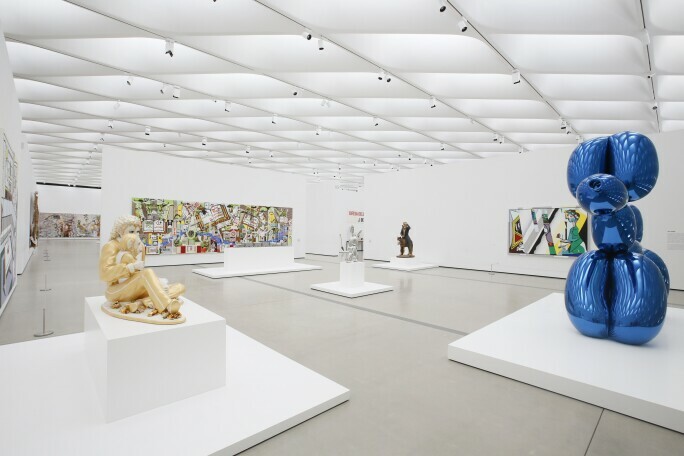 Installation of works by Lari Pittman and Jeff Koons in The Broad's third-floor galleries. Courtesy: The Broad. Photo: Ryan Miller. Philanthropist Eli Broad’s name appears on cultural institutions all across Los Angeles but it is the Broad that has made the biggest splash. 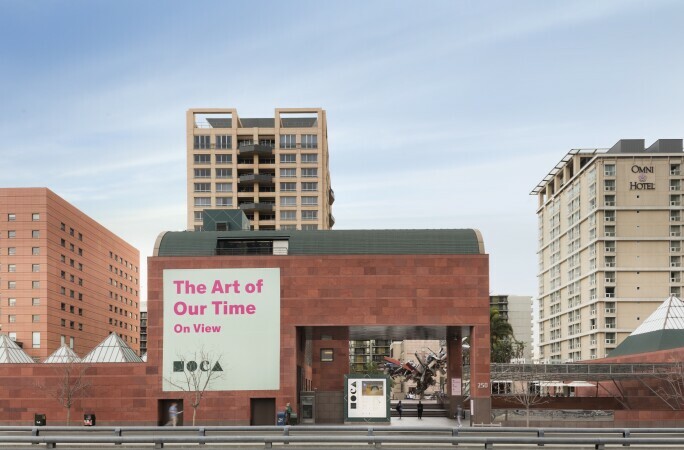 It opened in 2015 to house his impressive Modern and contemporary art collection, In a Diller Scofidio + Renfro-designed building adjacent to the iconic Walt Disney Concert Hall (which Broad also funded) and opposite MOCA, hip young patrons queue around the block in order to gain (free) timed entry to galleries containing Instagrammable works by Takashi Murakami, Jeff Koons, and Yayoi Kusama. The Maurice and Paul Marciano Art Foundation Sculpture Garden. Image courtesy of the Marciano Art Foundation. The Marciano Art Foundation was founded by Guess Jeans founders Paul and Maurice Marciano. They renovated this imposing 1961-built Scottish Rite Masonic temple on a quiet stretch of Wilshire Boulevard between the Miracle Mile and Koreatown. Architect Kulapat Yantrasast retained many of the temple’s original details – including a mosaic mural by the original building’s designer, mid-century artist Millard Sheets, now hidden behind a wall in the main gallery. Insider tip: Don’t miss the fascinating Relic Room – a display of Masonic artefacts found in the building before renovation. The exterior of the Hammer Museum. Photo: Eric Staudenmaier. Though relatively small (until a $180m expansion is completed in 2020), and inconveniently located (for most of the eastsider art community, at least), the Hammer is now arguably Los Angeles’ most dynamic contemporary art museum. The essential Made in LA biennial, set for its fifth iteration in 2020, and the ongoing series of Hammer Projects showcasing emerging artists, prove that the Hammer’s curators have their fingers firmly on the pulse of the international art world. The Outer Peristyle at the Getty Center. Photo: Tahnee L. Cracchiola. Nothing compares to the experience of grandly ascending via the Getty’s monorail to the Richard Meier-designed Getty Center, leaving the traffic-clogged 405 freeway behind and instead gazing out over the Pacific Ocean. This collection of institutions – including the Getty Museum (art and architecture) and the Getty Research Institute, among others – were endowed by oil magnate J Paul Getty. Los Angeles Light and Space artist Robert Irwin designed the garden – an artwork in itself. Don’t miss: The archival exhibitions at the Getty Research Institute, and the spectacular cactus garden. 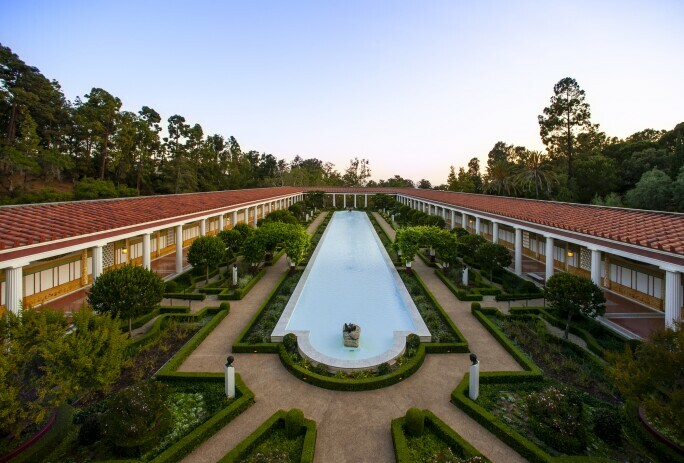 Insider tip: Your parking ticket is also valid at the Getty Villa in Malibu, where contemporary exhibitions complement a collection of antiquities. 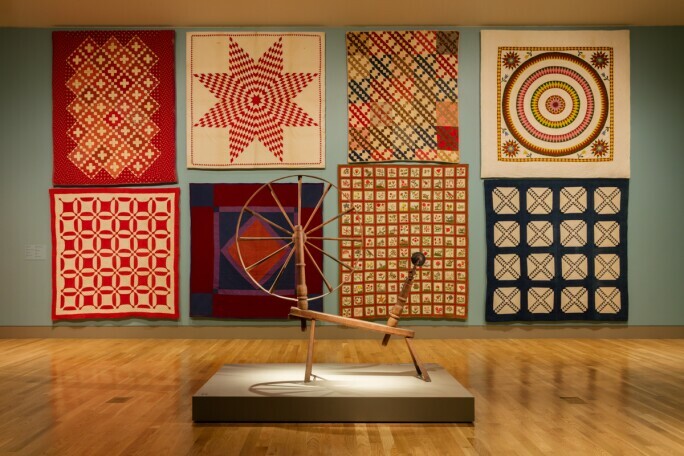 Early American art is on view in the new installation Becoming America in the Jonathan and Karin Fielding Wing of the Scott Galleries of American Art at the Huntington Library, Art Collections and Botanical Gardens. Photo: The Huntington Library, Art Collections and Botanical Gardens. Located in San Marino, south of Pasadena, the Huntington is well worth the journey off the beaten art path. Based around a mansion built by railroad tycoon Henry Huntington and his wife Arabella, the institution also includes the magnificent library, the newly extended Galleries of American Art, the Japanese Garden and the astonishing Garden of Flowing Fragrance – one of the largest Chinese gardens outside China. Insider tip: many visitors head straight to Thomas Gainsborough’s famous painting The Blue Boy, overlooking the staggering collection of books and manuscripts in the library. 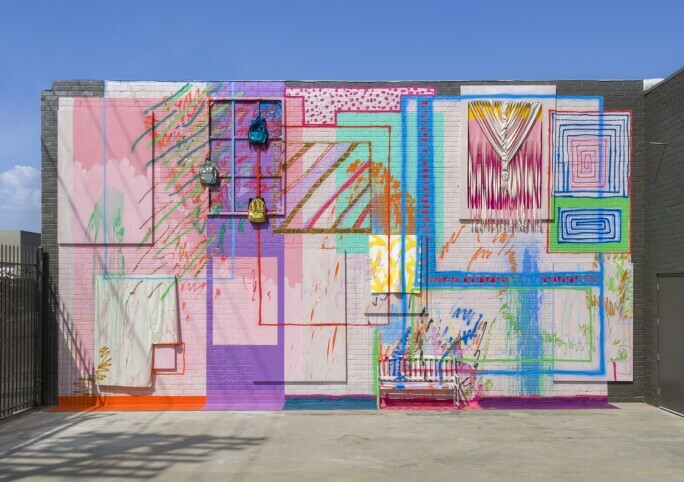 Sarah Cain, now I'm going to tell you everything, 2017. Institute of Contemporary Art, Los Angeles. Photo: Jeff McLane. After some years of uncertainty, in 2017 the shuttered Santa Monica Museum of Art was reborn in downtown Los Angeles as the Institute of Contemporary Art, Los Angeles, in an industrial building refurbished by the LA art world’s favourite architect, Kulapat Yantrasast. Its Kunsthalle-style programme includes events and pop-up projects alongside major exhibitions in its expansive main space. Insider tip: Parking is scarce, so consider Uber or – if you’re feeling cheeky – the car park of the nearby McDonald’s. The garden at the Los Angeles Municipal Art Gallery. Photo: Joshua White. 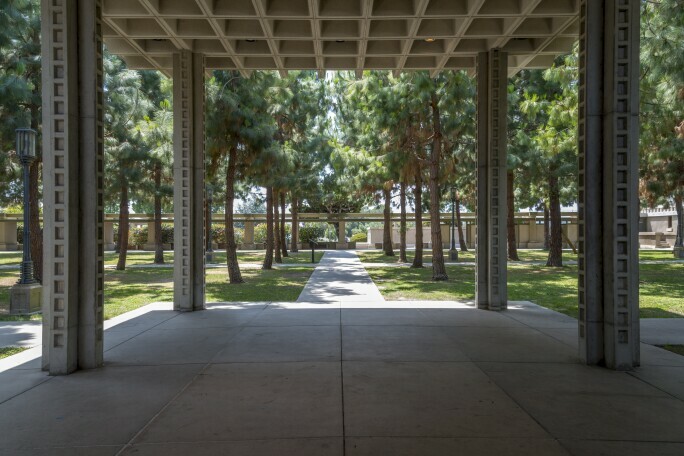 The Los Angeles Municipal Art Gallery, in the hilltop Barnsdall Park, is currently enjoying a new lease of life, with a revitalised exhibition programme. While you are there, take a tour of the Frank Lloyd Wright-designed Hollyhock House, and try to spot his iconic Ennis House in the hills beneath the Hollywood sign. Installation view of Sam Francis's Basel Mural I. 1956-58. 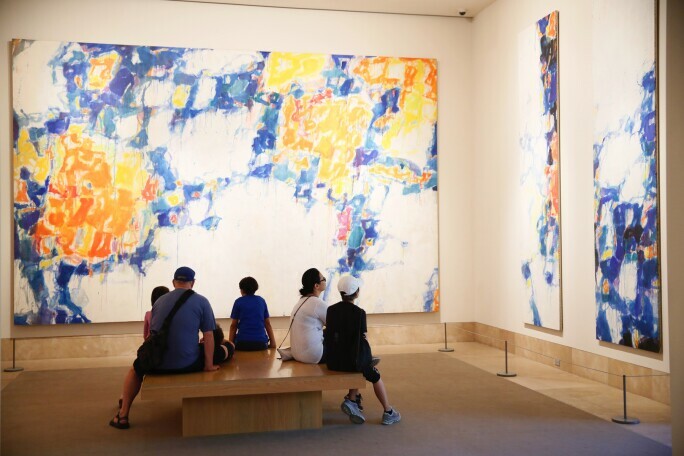 Photo: Norton Simon Art Foundation. Formerly the Pasadena Art Museum, the Norton Simon Museum is named after a local industrialist who, in 1974, rescued it from financial ruin. The museum contains Norton Simon’s substantial collection of European art, from the Renaissance to the 20th century, his collection of ancient South and Southeast Asian art, and Modern masterworks formerly owned by the Pasadena Art Museum, including a room devoted to Sam Francis’s 1954-56 Basel Murals. 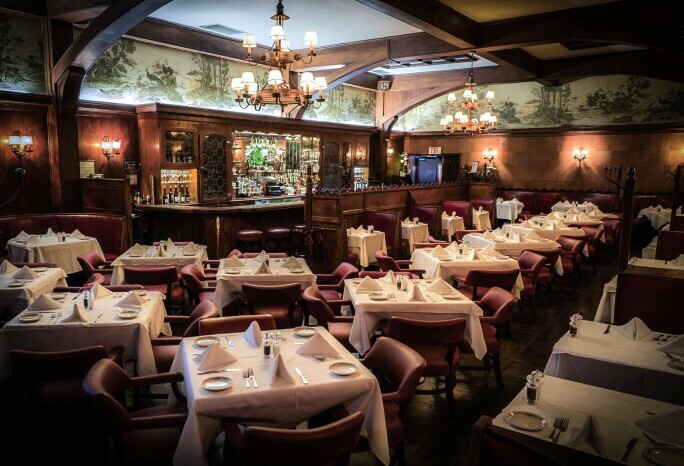 The Musso & Frank Grill. Photo: Tina Whatcott. Opened in the 1940s opposite the now-demolished Ambassador Hotel (site of Robert Kennedy’s assassination), The Prince retains some of its former glamour. Now Korean-owned, it has been used as a location for movies and TV shows from Chinatown to Mad Men. Its fried chicken is not to be missed after a few cocktails. Founded by artists Flora Wiegmann, Drew Heitzler and Justin Beal in the mid-2000s, Culver City watering hole the Mandrake remains one of the few places near the galleries on La Cienega Avenue to grab a drink. DJ sets draw a diverse crowd later in the evenings. A taste of old-school Hollywood, the lavish Musso and Frank’s is as famous for its steak as it is for its martinis. This year it celebrates 100 years in business. Manuela at Hauser & Wirth, Los Angeles. Photo: Sim Canetty-Clarke. 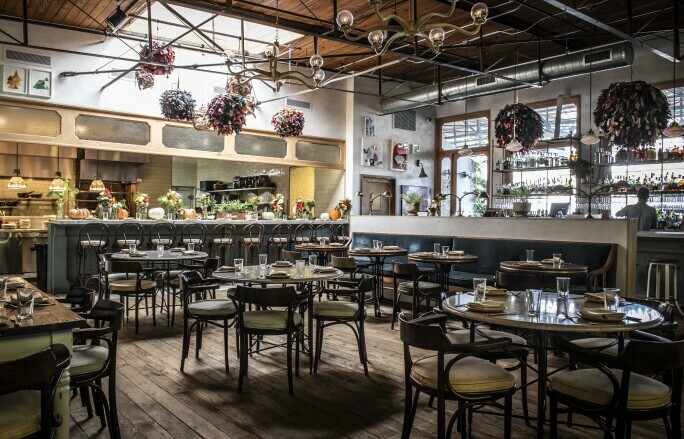 The in-house restaurant at Hauser & Wirth, in downtown’s Arts District, Manuela is named after gallerist Ivan Wirth’s mother. The menu epitomises Southern California’s farm-to-table, seasonal food ethos, with sophisticated dishes drawing on Mexican, French, Asian and Southern cuisines. Bag a table outdoors amongst the luxuriant foliage. Contemporary Israeli cuisine is currently seeing a surge in popularity in Los Angeles, and Bavel is a shining example of the genre. Chefs Ori Menashe and Genevieve Gergis attest to the influence of their family roots not only in Israel but also Egypt, Morocco and Turkey, with dishes such as slow-roasted lamb neck shawarma. Under no circumstances skimp on the hummus order. Since it opened as a preserves shop on an unprepossessing strip south of Silver Lake in 2011, Sqirl has steadily grown in influence and cache – though not enough in square footage to satisfy the long line of devoted customers that forms along the pavement every day. Neither breakfast or lunch is complete without a slab of Sqirl’s ‘Famed Ricotta Toast’ (as it appears on the menu) slathered in house-made jam. A room at the LINE LA. Photo: Chase Daniel. Situated on a bend of the otherwise seamy Sunset Strip, the Chateau (as it is widely known) remains the hippest place to dine, drink and sleep for the worlds of art and entertainment alike. To really experience it at its most exclusive, splash out on one of the legendary private bungalows. A sanctuary in the midst of action-packed West Hollywood, the Petit Ermitage is a warren of cosy corners and tranquil patios. Check out the guest-only rooftop garden – recognised by the US National Wildlife Federation as a sanctuary for hummingbirds and butterflies – and saltwater pool. 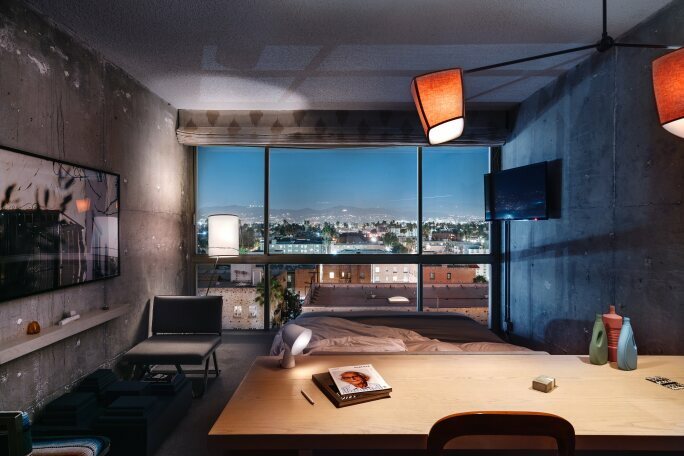 Conveniently located in Koreatown, partway between downtown and Hollywood, LINE LA is one of the more stylish recent additions to the city’s hotel scene. Alongside concrete-walled, minimalist rooms, the poolside restaurant Openaire resembles a giant greenhouse, while the supercool Break Room 86 attracts clubbers from across the city. Residents have long bemoaned the ineffectiveness of LA’s public transport system, and while the Expo line now connects Santa Monica to Downtown, the car remains king in the City of Angels. Rent a car at the airport – and download the essential navigation app Waze – or use Uber or Lyft. Don’t expect to hail a passing cab on the street!